Really happy to share the successful outcome of 100% natural Morindin extracted from morus indica roots. This was done at production unit of Geeta hand printers Tarapur village of Madhya Pradesh. Alizarin is one of the most precious dye form used by traditional hand block printers in India, but today natural alizarin is replaced by synthetic alternative. In place of natural alizarin we got natural morindin to get pale yellow to brownish yellow color. Before invention of synthetic alizarin during the year 1869 natural alizarin extracted from the roots of "Al-Tree". Some 50 years ago it was practiced by many hand block printers in India but due to non availability and cumbersome process it was extinct from the market and replaced by low cost synthetic alizarin prepared in the Lab. Color of natural alizarin was varied and completely dependent on the age of tree whose roots were used to extract it. It was having a limitation i.e. to get the roots of "Al Tree" before plant crosses the age of 4 years. But here color shade of morus indica roots varies from deep brownish yellow to golden yellow, depending upon the quantity, boiling temperature, time period of boiling and age of the roots. 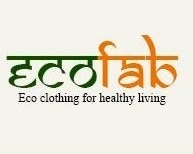 Now EcoFab with the help of "Chhippa" brothers Shri Pawan Jhariya & Shri Banwari Jhariya reinvent the age-old technique of hand block print dyeing with newly found roots of species of morinda tree family. Its color shade is a natural beauty and completely different from synthetic alizarin. Constant experimentation and exploring the age-old technique was equally joyful, fun and satisfaction. This success is also important for us because during my visit to as many as traditional hand block printing clusters and interaction with as many as craft patrons was unable to get a clue what it was originally used except the name "Al roots". Special thanks to Prem Joshi ji for providing us roots, Pankaj bhai & RahimGutti ji for their inputs.